Just to clarify, I will not be revisiting any topics for errors except the actual error report topics. I might take care of the issues as they are posted, but if I'm not able to for whatever reason, they will be forgotten. Please always post errors to the error report topics. Okay. There are several topics that show SF3 scenario 3 errors in them. Should I leave them as they are (separate topics), or should I merge them all into this one? Wow, you can do that? One place would be nice. i couldnt help but notice that someone said that were bugs in shining force 3 scenario 3 chapter 2 with the translation patch but how did you make it to chapter 2 when the game freezes at the end of chapter 1? im using ssf by the way. i know im not that far into the game but i really hope i dont have to start all over again. i mean, i will if i have to but i wanna avoid it if i can. from what im reading here, with the translation patch version of sf3s3, you cant get past chapter 1 right? or am i missing something here? it always gives me a black screen at the end of chapter 1. You can simply save ingame just before you defeat Goriate and then exchange the disc with the original disc. This way you avoid the crash point and can change back after you saved again. Another way is to use an older version of SSF. But I don't really know, which version will work, maybe 008. I’d like to ask – report some sort of “bug” that happened to me: I was playing Sc 3 (Julian) and at the final of chapter 6, the battle against Medion army, every Uryudo’s action (not moving or standing still, but attacking or healing someone) the game “crashed” – I couldn’t even reset the game with the control, I had to use the reset button. This problem continues when I change to Medion (I just played at the ruins and it happened again). Did this ever happened to anyone? Luckily, I used the japanese version, and everything went fine. Thank you guys again, and keep rockin’!!! Now to report the error I've found. After getting Marki to join your group, if you use her Proserpina spell, the game crashes. Ive found this happens if you use the Abyss Wand which casts the Proserpina spell as well. I've confirmed this both with my own disc and several different ISO's downloaded from various download sites around the net. This is the single most awesome looking spell in the entire game series in my opinion, so please look into this when you are ready to to do full testing on Scenario 3. The Proserpina issue is known, but it's not caused by the translation patch, it's the game in general. If you don't have the right BIOS loaded into your emulator, the game doesn't understand how to handle that particular spell correctly. I believe that is the only bit of game that will happen to, and don't ask for the BIOS files, because supplying those is both illegal and violates board rules. My Shining Force 3 Let's Play! Playing through scenario 3 i got the same crash at the end of chapter 3 as i did in chapter 1, right now i would prefer not to do battle 13 again, has this happened to anyone else? Yes hi, i am playing on a real sega saturn. I've been having trouble playing the translation but it was only minor problems occasionally, but now this is stopping me full force. Immediately after the "Shining force translation project" watermark, my game is supposed to play the opening movie, but goes to cd read error. On -2- Sega saturns and 4 different burns at 16x, on the same media that has gotten me through Sc.1 and Sc.2 (Verbatim). I can't burn slower and finding below 16x cd's is hard anyhow. What gives, they were working FINE previously, sometimes laggy. but now won't even get to the movie. Even when i have no Save File in the system (I thought maybe something in my save data might be triggering it?) Please help!!!! I can't really say what your specific issue is, but I have to assume it is not a patch issue, so the request should go somewhere else. It would not surprise me if both your saturns were having issues (but you should try adjusting the lasers). Try running the patch with an emulator and if you don't experience the same thing, we will be able to exclude the patch as a source. 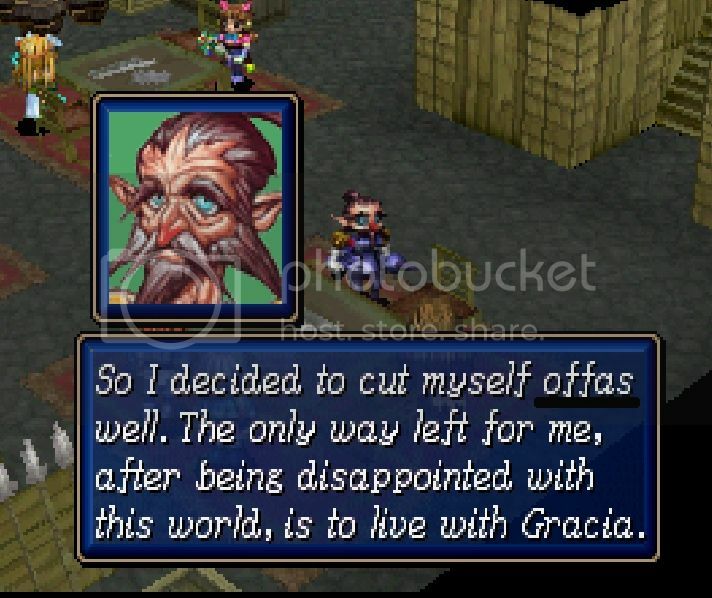 ...Immediately after the "Shining force translation project" watermark, my game is supposed to play the opening movie, but goes to cd read error. Playing SF3 on physical Sega Saturn, using the swap trick. Using downloaded and burned files. Played Scenario 1 through to completion and saved on back up ram cart. Played Scenario 2 through to completion and saved on back up ram cart. Would really like to play Scenario 3 using my existing saved files. When I attempt to play Scenario 3 I get "CD read error" after SF Translation Project watermark, but before opening movie plays. Using the Japanese version of the game I was able to load the game and get through the opening sequence and create a Scenario 3 save continued from my other completed games. I have tried using two different Saturn consoles, and both give me the same result. I have tried burning the patch at various speeds on multiple computers and using different downloaded ROMs. I have tried burning pre-patched ROMS. Everyone gives me the same result. Like MoonKnight I have not been able to locate a computer that will burn below 8x, so perhaps that is part of the problem. Are MoonKnight and I the only ones experiencing these problems? It seems that most others are playing the games through emulation. I'm posting in this section because it would appear that this is a patch issue since the Japanese version plays just fine. Any help and or advice would be appreciated. I'm afraid you are not eligible for support if you are not using the original Sc3 disc with the patch. We can't possibly rely on an ISO from the internet, so that will be what I blame every time. And even if you were using the original disc, I would suggest you follow the instructions on the official site EXACTLY. Failing that, I would have to blame hardware if everyone doesn't have the same issue. When: in the end of chapter 3 Donhort talks with Emperor about Julian and Medion. What: I changed both Medion's and Julian names, but while Medion's name replaced correctly, Julian remains Julian. When: Chapter 4, trying to left Aspinia/Aspia. What: It's default Jumesyn Instead of EnMCo (Enixo, Merlin, Corwin). Screen attached. PS: for those, who have CD read error using emuls - I have that errors in scenario 3 while using girigiri. Ssf doesn't fail me though. Looks like your intuition was correct. I tried the patched version of Scenario 3 on a Model 2 Saturn and it works just fine. I therefore surmise that the patched version of scenario 3 does not work on Model 1 Saturns. The internet ISO was reliable, it was my hardware that let me down. I would assume it is that particular saturn, not all model 1 saturns. It probably just needs a laser adjustment. In general burned discs are harder to read than factory pressed. I can appreciate your skepticism, but FYI, I tried this on two Model 1 Saturns with the same exact result. I'd be interested to hear from someone who had success with Scenario 3 on a Model 1, i.e. laser repair etc. Perhaps the older a Saturn is and it's relative condition have the greatest impact on function, but that would mean that Model 1's being the oldest would on average have the greatest chance of not working, i.e. providing the dreaded CD Read Error.